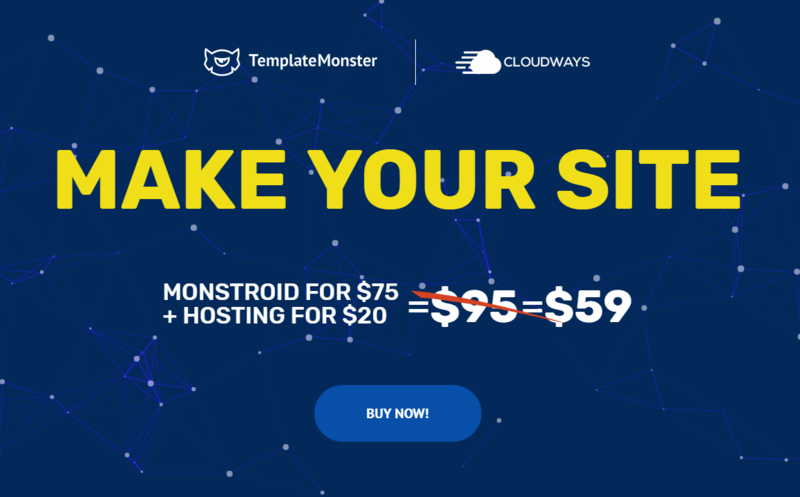 TemplateMonster offers you to buy its WordPress flagship called Monstroid2 together with an incredible Cloudways hosting. Yet you will not need to pay its full price of $95 for this package. This mix of power and professionalism comes with a 37% discount. This means that this ready-made solution and hosting will cost you only $59. If we were you, we would definitely grab this offer here and now. What Is About Cloudways Hosting? We want to speak a little bit more about everything that you are going to get. If you decide to pay your attention to this offer, you will get $20 hosting credit from Cloudways Hosting. In other words, you will get 2-month free hosting for your future website (while others need to pay $10 a month). Make sure to grab this deal and save a great deal of money on building your future website!